Writer Tony Lee is joined by MacGyver series creator Lee David Zlotoff to bring Mac into a whole new adventure that is exciting, funny, and just all around fantastic. What’s best about this comic is that, unlike many first issues, it’s not 90% origin, in fact, it’s 0% origin story!!! You just jump right in to a full out MacGyver adventure. 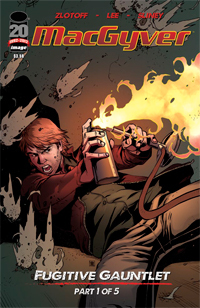 There’s all the MacGyver hallmarks in the first issue. The leather jacket, the making weapons out of everyday items — all that’s missing in this issue is the jeep. And none of it is forced; they’re all included organically in the story. It’s great to see Mac back in true form. Over the years, there’s been many false starts on new MacGyver projects like a movie or new TV show, but when this comic was announced at last year’s San Diego Comic-Con, MacGyver fans all over the world cheered. This first issue is, in a word, perfect. Mac receives a call from an old professor asking for help and, in typical MacGyver fashion, is thrust into the middle of a full out war between secret government factions, and is mistaken as the villain himself. If that isn’t enough, someone’s put a bounty on his head, so he’s got hitmen literally gunning for him. The really and truly seems like you’re experiencing an episode of MacGyver that you haven’t seen before. But, I shouldn’t be surprised because you’ve got Tony Lee, a fine writer in his own right, PLUS you’ve got the creator of the TV series, Lee David Zlotoff. With these two writers working on the comic, I would be surprised if it was anything less than perfect. Artist Will Sliney is a great choice for this project. He does a fantastic job of making MacGyver LOOK like MacGyver. Not Richard Dean Anderson, but MacGyver. It’s hard to point to exact examples, but Sliney does a fantastic job. Aside from that, he’s a very solid artist. He’s great at drawing action and he does a great job at drawing MacGyver’s gadgets and not just making them look like a Bunsen burner and a rubber band, you can actually SEE how that gadgets work and function. There’s a couple different locations that are used in the book, and those are rendered with great accuracy. The art is all around solid, to say the least. Page layouts are great, his story telling is kinetic and exciting, and his details are spot on. MacGyver fans rejoice!!! This book is everything that you wanted and hoped for. Just a side note, be sure to read Lee David Zlotoff’s piece in the back of the book about the creation of the TV series. It’s very entertaining and filled with insight into the creative process. This is a fantastic comic that anyone & everyone will enjoy. I can’t recommend it highly enough.